The 11th Enquire conference takes place at an important historical and cultural moment, as the United Kingdom prepares to leave the European Union on the 29th March 2019. Despite the proximity of the deadline for the UK’s exit from the EU, there remains much uncertainty regarding the implications of Brexit, especially for those involved in conducting and participating in social research. What will be the effects of Brexit for researchers engaged in international scholarly enterprises, funding bids and data collection? These are pertinent and timely questions that we wish to unpack within this conference. Yet, Brexit demonstrates just one of many recent developments which have highlighted the uncertainty and precarity of contemporary political, social and cultural contexts. Uncertainty is a central issue within the social sciences. For decades, researchers and scholars have grappled with the problem of how to study society, and social processes, in such a way as to generate “certain” research knowledge about them. Uncertainty within the academe has become an ever-more prominent challenge: short-term casual contracts, ongoing battles for equal pay for equal work, as well as the recent strike action over pensions serve to emphasise the precarious circumstances in which researchers and academics increasingly find themselves operating. So too, events such as the Windrush scandal have uncovered the ways in which state actors can utilise their power to alter the boundaries of citizenship, and deny rights to those who are UK citizens. The increasingly hostile nature of the UK environment for both citizens and non-citizens alike can be seen as the source of much uncertainty for both researchers and research participants. 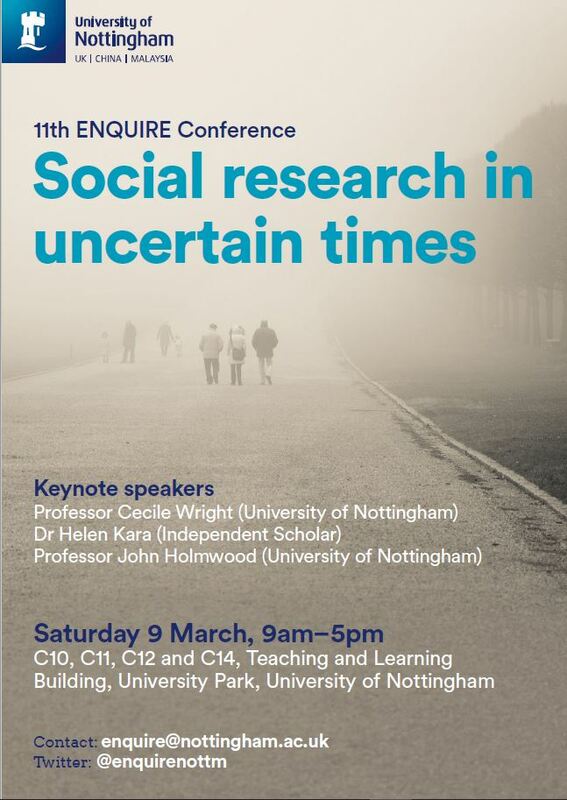 Considering such issues, for the 11th Enquire conference we wish to bring together students and scholars for a thoughtful and timely discussion about social research in uncertain times. We are especially interested in proposals that take a critical stance towards the concept of uncertainty, and consider its implications both in relation to the context in which social research takes place and the process by which it is undertaken. Abstracts should be 250 words in length for presentations of 15 minutes, with 5 minutes for Q&A. Abstracts should be submitted to enquire@nottingham.ac.uk by 28th January 2019. Successful applicants will be contacted by 8th February 2019. We look forward to hearing from you! Registration will be opening soon – we will post again shortly with more information!